I was having coffee with my makeup artist friend, Melissa, last week, and in between bites of pumpkin pie we got into brushes. She brought up the marvelous multitasking MAC 217 Blending Brush ($22.50), one of my go-to faves. With a goat hair fiber brush head, it applies and blends powder and cream products with much aplomb. I use it for everything from powder and cream shadows, to loose pigments, to under-eye concealer. The domed brush head is neither too big, nor too small, and the rounded tip perfectly fits the nooks and crannies (like the crease, outer V and inner corner) around my eyes. Try covering your dark circles with one or two drops of MAC Fast Response Eye Cream ($30) mixed in with your regular liquid concealer and applied under your eyes with the MAC 217. The brush is good at very soft, light applications (the airbrush effect), and with this blend it works great for gals who need light to medium dark circle coverage. You can’t go wrong with the MAC 217. I actually have two in my stash — one I use strictly for eyeshadows, and one for under-eye concealer. P.S. 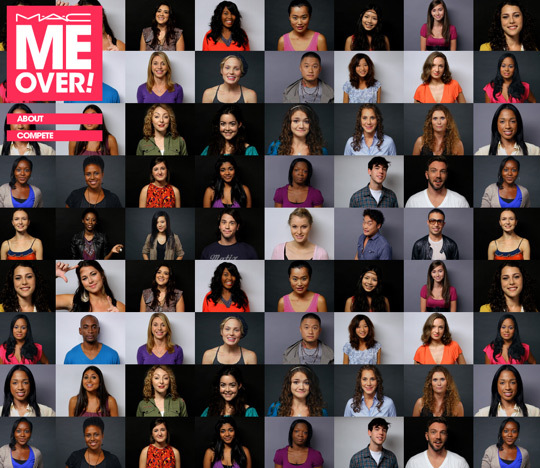 If you’re a MAC fan, get a load of this: the company just launched a new contest called MAC Me Over to find models for their fall 2011 color collection. To enter, submit a video or a photo and finish this sentence: “MAC me over because ____” (full details here). I think we should all go for it! Who’s with me? 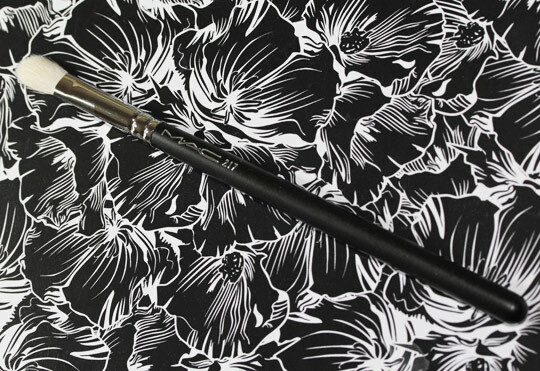 Previous Post: Ultraflesh Panthera Mascara Makes Lashes Roar Like a Jungle Cat! If you’re too lazy to wash you could always do a quickie in-between brush cleaning with some anti-bacterial wipes. ^ I agree, I can’t stop staring at those flowers! Mm I’ve been looking for a GOOD blending brush for a little while, and it looks like it’s time to invest in one quality instead of considering buying several cheap bad ones (my usual technique).. I’m terrible at blending now matter how much time I spend on it, but I don’t know if I can blame it all on the brush! Oh no. 🙁 Maybe you can look for a brush with a similar shape? Gosh… I just bought this brush two weeks ago, and not a day has gone by without me using it!! I love how it handles and how its so versatile. Isn’t it the best brush? Totally a MAC must-have. Do you have the 239, btw? That one’s great, too. I agree, the flowers in the background are beautiful. I heard raves about this brush and can’t wait to get my hands on it. My blending brush is becoming too old and ruined and would be a perfect replacement. I hope you try this! Please let me know what you think of it. MAC recommended brush 224 for undereye concealer application, what are your thoughts on this brush versus the one you have? I think it’s fine for concealer application, but for me personally I think the brush head’s too soft. I like a bit more firmness, but then again I need medium to heavy coverage. If you only need light coverage and you already like the brush then you’re good! I find that you can replace any of the MAC brushes with cheaper brushes, except this one. I can’t figure it out! This one is just un-dupable. Anina recently posted … For doll lashes! Oh, they should definitely pick you! I told you gold/blue was gonna be your gateway color! The 224 is pretty rad; I really like that one, too, especially for very soft effects. 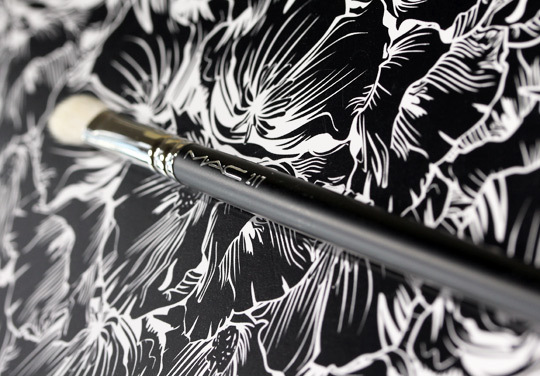 Have you ever tried using it to apply color in the crease? I know a lot of people love it for that, but for me it just doesn’t work. The shadow ends up all over the palce. Hm, I don’t use it for the crease. I prefer the 217’s tip for the crease, or the 219 for that crease to outer v design. I hear ya. One thing that also helps is re-shaping the brush bristles before you lay the brush down to dry! I love 217, it was my first MAC brush. I use it for eyeshadows and also for applying MAC Moisturecover concealer. I do love me a good blending brush! Right now, I am using one by Sonia Kaushuk that I really like. I have yet to expand into the world of more expensive brushes, but I think I would try this. Thanks for sharing! What other budget brushes do you like? I like the Essence of Beauty brushes from CVS. I have a foundation brush and two eyeshadow crease brushes that I use on a daily basis. I have heard good things about Eco Tools as well, but I haven’t tried those yet. Hi Ruchita, I recently picked up Eco Tools’ eyeshadow brush (mainly because it was 2.99 at Walgreens). It’s quite good, slightly softer in texture than MAC’s 217 and picks up quite a bit of colour. This looks pretty similar to my Sephora #29 blending brush. I think it was about $2 cheaper, which isn’t much, and I think it’s made from different hair (since it has brown bristles). I never thought to use it for concealer, I might have to give it a shot! Good thing you found it. Where was it hiding? The 217 feels really soft. I love th efeel of it on my crease! I actually think this is pretty cost effective. I have had this brush since sophomore year of high school (I’m in my last year of college) and it still looks brand new in terms of shape and power (its not as white though…more like off white, which is not too bad considering I use this to darken my outer v). Same here — I’ve had mine since 2002. It’s held up amazingly well, and it hardly ever sheds. I LOVE this brush! Have you ever used the 219? I’m thinking about getting it, because it seems like it’s a similar-but-smaller version of the 217, which I could use for creasework or lining the eyes. What MAC brushes do you like BEST for your eyes? I really need help with brushes. =O Would you say the 217 is best for blending? My eyes are sort of like yours.. Thanks! I think I have four 217 brushes. You can never have too many. It’s on my list for something to get when I have spare cash. I don’t think it’s as stiff as the MAC brush, but I’ve found an amazing vegan alternative to this in EcoTools’s five piece brush set. Unfortunately this eye shading brush isn’t available on its own but it gives that perfect diffuse look to powder shadows. 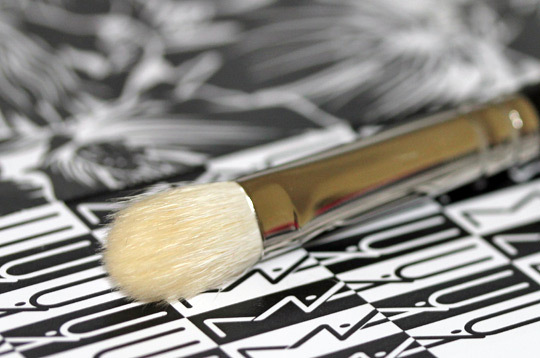 The 217 was one of my first MAC brushes ever. It’s definitely one of the must have brushes. Jenn @ So Very Fabulous recently posted … IMATS Toronto 2010 Haul! I have a story concerning that brush! One weekend I visited my parents and then I packed my things to leave again. The 217 fell on the floor without me noticing it. Next weekend I came back and found it, still lying on the floor. I picked it up and suddenly little parts of bristles fell down. SomeTHING had EATEN parts of the bristles on one side! I mean, which bug (or whatever it might have been) eats bristles?! Hey Karen, I know this is a weird question, but can you compare your two 217’s side by side. i just bought another one from MAC and when I compare it to the one I got at Nordies, there are noticeable differences. Has anyone else noticed this?